As we all know that a fit body leads to a happy mind, keeping yourself in perfect spirits is highly important during your nine-month stint. Chalk out a workout schedule for yourself and don’t let the baby fat take over your body. There are various safe arm exercises you can do at the prenatal stage for increased mobility and flexibility. Consult your doctor or physiotherapist before attempting any exercises though, particularly if you have a high-risk pregnancy. Although these are considered safe throughout pregnancy, your overall health and physical fitness must be taken into consideration. How does it help: Strengthens your shoulder, chest and back muscles . Support the wall or an elevated object using both hands and move your feet back so that your body is in an inclined position. Lower your chest gradually and breathe in. Make sure that the body is in proper alignment. Breathe out as you return to the initial position . How does it help: One of the best arm toning exercises for pregnancy, also enhances the flexibility of the brachialis (upper arm muscles) and brachioradialis (forearm muscle) [2,13]. Ideal position: Sitting on a stability ball or armless chair or while standing . Place your legs apart up to the width of your shoulder, or sit with your feet well-supported on the ground. Whether sitting or standing, loosen your knees, with your elbows in and chest up. Breathe in as you gradually pull a 3-5 pounds weight in each hand toward your shoulders. When your forearms and the floor are perpendicular to each other, start going back to the original position [2,4]. How does it help: Helps to strengthen the arm, shoulder and back muscles, enhancing your overall fitness. 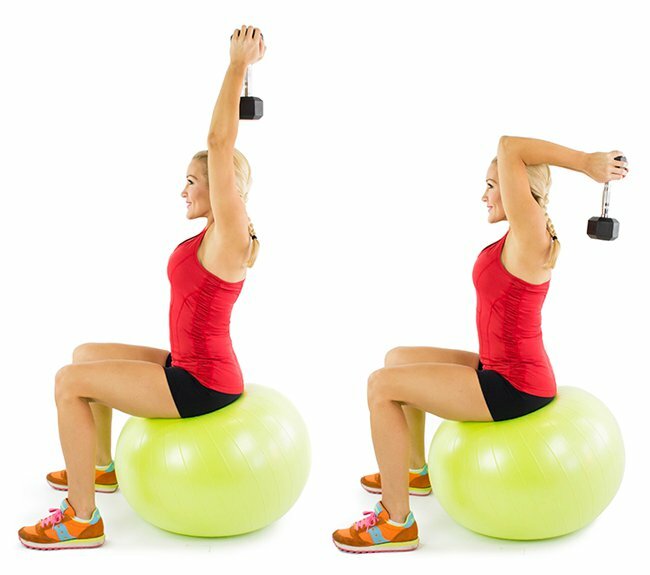 Stand still and hold a 5-pound weight in each hand with your palm facing inwards in the direction of your thigh. Now gently lift your arms to the side with your elbows being slightly bent, and your hand tilted a little forward. Once your hands go up, breathe out slowly and stay in that posture for a second. When you are lowering the weight, breathe in again and slowly place your arms to your side [3, 15]. How does it help: One of the most beneficial back arm exercises you can do when pregnant as it tones the muscles of your upper arms, helping you to do away with the soft and soggy muscles that are quite common during and after pregnancy . Ideal position: Sitting on a stability ball or armless chair or while standing [1,15]. Hold one heavy dumbbell (6 pounds) or two light ones (3-4 pounds each) and raise your hands with the weight facing the direction of your head. Now gradually bend your arms towards the back of your head until the elbows form a 90° angle. Be in that position for a few seconds and lift your arms again as you exhale [3,15]. How does it help: Strengthens muscles of your upper body contributing towards body flexibility . While standing, pull your stomach in and place your knees apart, whereas if seated maintain a proper posture with the feet placed flat on the ground. 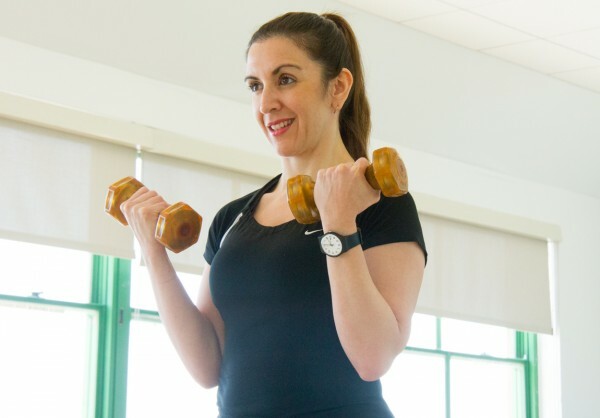 Hold a 3-5-pound dumbbell in each hand, raising your upper arms to the height of your shoulders so that the weights are positioned at the ear level. Inhale as you bring your hands down. [3,7]. How does it help: Besides your arms, it is also a good workout for your legs and back. Strengthens your back muscles, facilitating in an overall fitness . Ideal position: Sitting on a stability ball or armless chair . While doing this exercise on a rug or carpet, sit on a pillow or cushion as a support to avoid exertion, especially if you are in your late trimesters. Wrap the loop of a resistance tube or band around your feet. Maintain a straight posture and by bending your elbows pull the band towards your body as you exhale. Inhale and go back to the starting position[6, 9]. How does it help: Increases your flexibility, also strengthening the back and shoulder muscles, minimizing possibilities of back pain [4,10]. Take a dumbbell of 3-5 pounds in each hand. Go to a bent-over posture by lowering your hip, flattening your back and placing both your arms in front. As you pull the weights apart, squeeze your shoulder blades and exhale. Inhale and get back to the starting posture [3,10]. Exercise on a flat and nonslippery surface . Do not overexert yourself and stop the moment you feel uncomfortable. Always keep a break of two to five minutes in between each set. Make sure the dumbbells are not too heavy as it could strain your muscles. 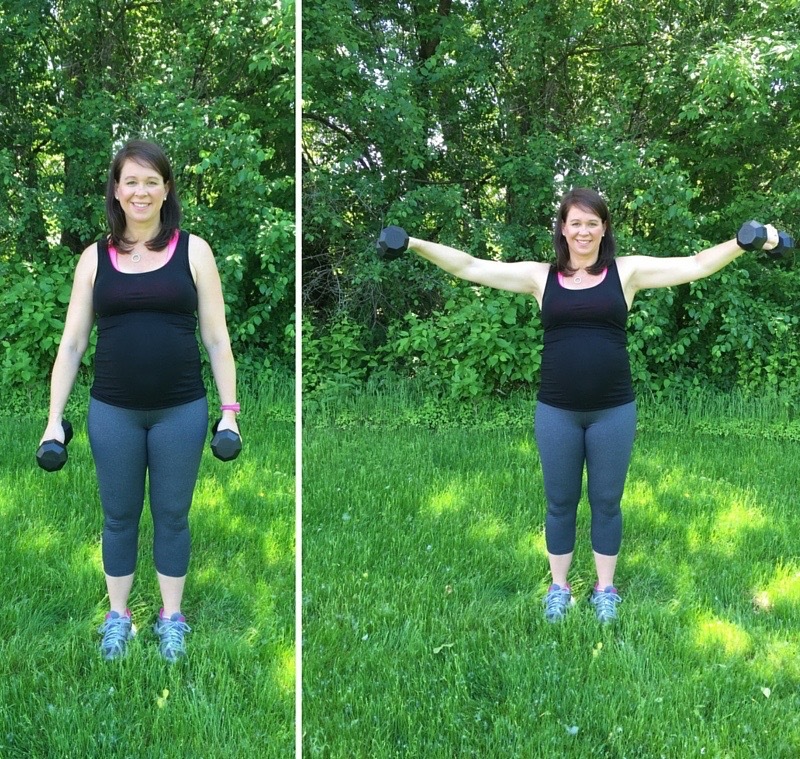 All of these arm exercises should be continued post pregnancy to ensure overall fitness.